The other day I tried two different building systems in the same environment with teenagers. Geodesic Domes have long been an interest of mine, and I have successfully made a few of them with straws and attempted to use other materials. 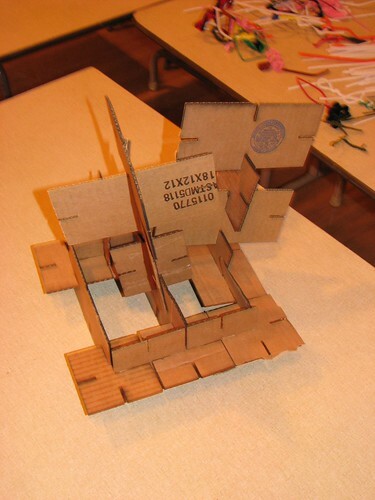 GIKs or Great Invention Kits are something of a newer building technique. When we were in South Africa, my daughter made a kit with a lot of help from one of the staffers at the Capetown Fab Lab. I have seen samples of them in all the Fab Labs I have been in. Early in the morning I sent out an email message asking if anybody had a copy of the cutting files I would need to make my own GIKs. Later in the morning I printed up some geodesic dome strut calculations for figuring out what size and how many struts and connectors we would need. With the information, a pen, metric ruler, lots of pipe cleaners and a box of colored straws I set out to measure the struts and cut them. The information came from Desert Domes, where there are a lot of calculators for different frequency domes. Their focus is more on conduit strutted domes, but I have adapted their info to straw domes in the past. During my process of gathering information and starting to build the geodesic dome, I was able to catch a few people to help out. It was pretty much a "Here is what you have to do, then you have to make some of these, and then some of these..." kind of experience. It was very much tied to the information that I had gotten. Too few struts, or the wrong size, and it won't work. We used a template on a piece of paper to get the sizes consistent. Each of the two sizes of struts (100 mm and 90mm) were a different color, to make identifying them easier. There were 4, 5 and 6 way connectors. Each was made with a different color pipe cleaner. After most of the struts were complete, I left to go to the Fab Lab at the South End Technology Center. During my time away, the materials were put aside to keep them from getting mixed up. The information was out and visible, but people didn't know enough about the project to figure it out. When I returned later, I brought a sample straw dome made several years earlier and a book on Geodesic Math. At the Fab Lab, I checked my email to see if there were any files available, but they were not. So I needed to make the files myself and then fabricate the GIK parts. During the process, I wrote up my workflow on how to design the file. The link to the process document is here. During my session at the lab, I made a few dozen parts of two designs, square 4x4's and rectangular 4x8's. I brought them all with me back to the group, and put them out on the same table as before. This was also a drop by activity, and I did a little recruiting, but not much. I showed a little of how to combine the shapes, and one teenage girl's eyes lit up when I asked her if she would like to try them. She and a few others quickly got the idea of how to attach the tab and slot shapes, and quickly built a shape out of them. As people passed in and out of the group, they added and modified the construction. The time shifted and people moved on to other activities. I was next in a room with a half dozen teenagers and one other adult. I brought the geodesic dome parts in with me and set out to make the shape from the parts. In the construction of the geodesic dome, Jen, the other adult said she was "fascinated to watch how I was building this thing", but she did not get engaged enough to join in. I explained what the different coloring was, and how there were colors for the connectors. I showed the diagram used for assembly. During a half hour or so, none of the teens joined in, preferring instead to play a card game (again, it was a personal choice time for the activities). As the dome got built, I had to keep referring to the diagram, and had to make sure I was getting it 'right'. The connectors were not staying in place, and I was clearly struggling to get the whole thing to stay together. I ultimately gave up after the bottom level of triangles was complete, but I could not get the horizontal layer of struts to stay in place without pulling out many of the connectors. I put the parts back into a basket and got them ready to take them home. During this time, I recalled trying to build a geodesic dome several years ago with my daughter and nieces, all preadolescents. That kit used plastic tubing held together with machine screws and nuts as the connectors, and wooden dowels to serve as struts. On that project, it was me who held the information and them who were serving more as helpers. We tried holding the fittings with duct tape, and even tried screwing the connectors to the dowels. As the kit failed to stay together, they lost interest in the project. What I see from this experience is that there was only one solution to the Geodesic Dome project/activity. If the parts were the wrong size, or if the directions were not carefully followed, and if all the problems were not resolved properly, then the dome would not stand up. In the GIK project/activity, there were many solutions. Each person would need a mininum of instruction, and would be free to create anything from imagination. As long as the parts were manufactured with pretty reasonable tolerances, the people using them would be able to get them together. From their assemblies, could come a lot of variations. They would not look exactly like "a building" or "a spaceship", but the ideas could come across in the object. Certainly there are lots of things that people have done with geodesic domes since their invention by Buckminster Fuller. They have been used as homes, shelters, playground equipment and much more. There is, however a static way in which they must be assembled. Once that level of requirement is met, then they can be used in very creative ways. Materials can be substituted, sheathing can be added, and much more. What I saw with my experiment trying out the two techniques out on a similar set of teenagers was that it was much more intuitive for people to get engaged with building from a kit of GIKs than from a kit of geodesic dome parts.